The supporting characters from Despicable Me get to star in their own film. Starting as single-celled yellow organisms, Minions evolve through the ages, perpetually serving the most despicable of masters. Continuously unsuccessful at keeping these masters, the Minions find themselves without someone to serve and fall into a deep depression. 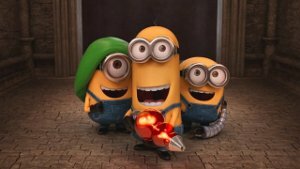 But one Minion named Kevin has a plan, and he, alongside teenage rebel Stuart and lovable little Bob, ventures out into the world to find a new evil boss for his brethren to follow. The trio eventually discover their next potential master, Scarlet Overkill, the world's first-ever female super-villain. They travel from frigid Antarctica to 1960s New York City, ending in mod London, where they must face their biggest challenge to date: saving all of Minionkind from annihilation. This film is releasing in both 2D and 3D, this is the 3D version.